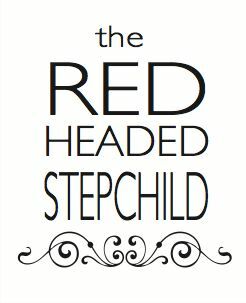 Whenever I make dinner for Mr. P and me – which I do five to six times a week – I typically try to make at least one extra serving, for lunches and leftover nights. And honestly, it’s these leftovers that really help me determine the success of a recipe. Unless I make something truly awful, Mr. P and I both are gonna eat whatever I just made at the end of a long workday – we’re hungry and tired and food is food. But it’s later, when there’s multiple leftover options in the fridge, that I can see what we go for first and what I enjoy the most. Today’s recipe is one of those that I was so excited about the leftovers. 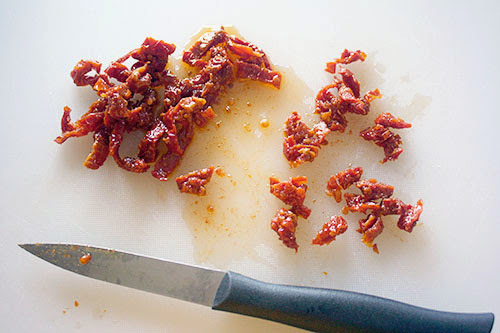 Inspired by this recipe, I decided to make a basic pasta with sundried tomatoes and pancetta – sounds tasty enough, right? Indeed, it was delicious the night we had it... but I had to force myself to wait a day or two until I’d finished the older leftovers before I let myself at it for lunch. And I was SO LOOKING FORWARD TO IT. When the leftovers were gone? I was super bummed. This is that kind of recipe. 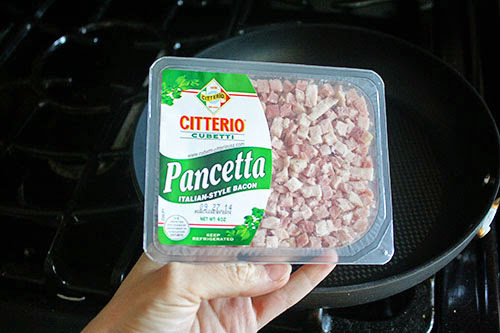 Start with the pancetta (and, I suppose, putting a pot of water on to boil). I got this stuff from Trader Joe’s, but I wouldn’t judge if you just chopped up some bacon and used that instead. Close enough! 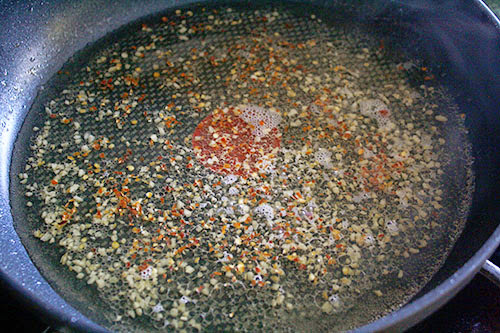 Fry it up in a skillet over fairly high heat. You want it to cook, obviously, and render delicious juices for your sauce... but you also want it to brown and char just a bit. DON’T LET IT BURN. You know I have very strong feelings about burnt garlic. 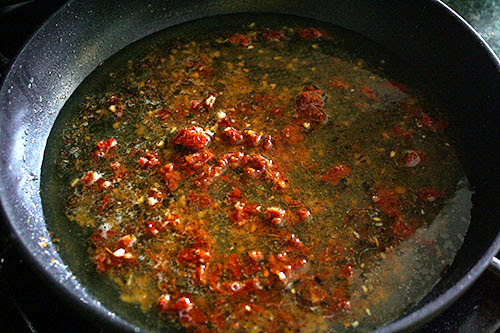 While that’s gently simmering to cook down (and, in the case of interested pregnant ladies, boil away some of the alcohol), dice up your sundried tomatoes. I used about a quarter-cup of julienned tomatoes, minus the oil. Oh, and hopefully, by this time your pasta water’s boiling. 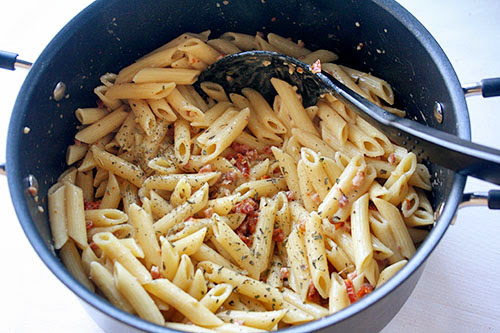 Go ahead and throw in the pasta. Don’t forget to salt the water! But back to the sauce. 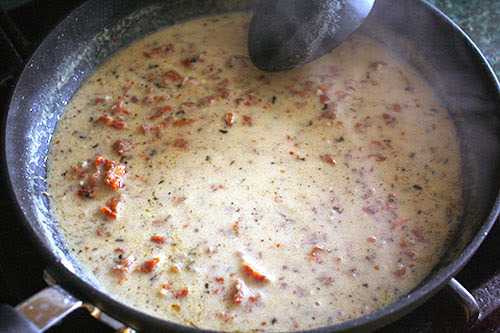 By now the wine’s cooked down, so add the diced tomatoes and 3/4 cup of chicken broth. 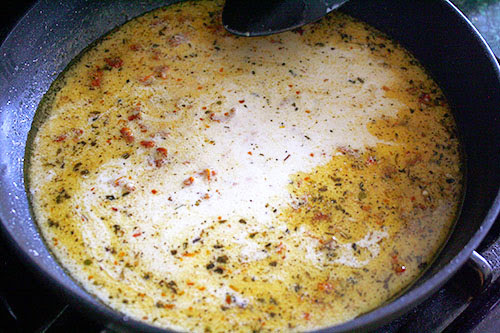 Turn the heat up to get it bubbling again, then reduce to simmer. Sorry the heat is all up-down-up-down in this recipe. You gotta get it cooking but not burning! There’s probably a better way, but this super-amateur cook doesn’t know it. 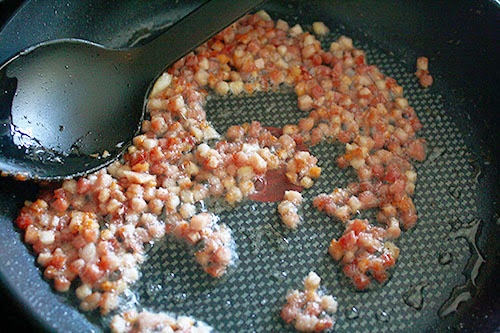 Finally, stir in the pancetta that’s been sitting so patiently off to the side this whole while. Wooo, so steamy. Yum yum. 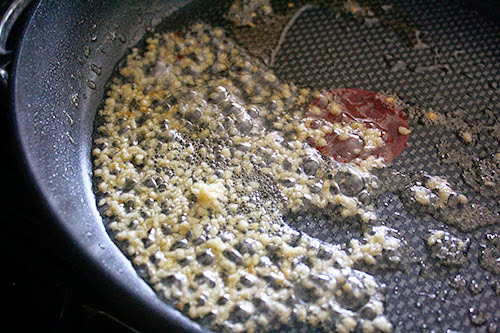 Hopefully your pasta’s done by now, so drain it and stir in the tasty sauce. I finished it with a bit more salt and basil, but that’s totally up to your taste preferences. Admittedly, while I was dying to eat these for leftovers, Mr. P was not. That worked out well for me – no worries that he’d eat it first – but just in the interest of fully representing all views, some people are just not as into creamy bacon-y pasta as me. But if you’re a pasta lover, especially of pastas that aren’t too saucy with a ton of flavor, this one’s for you! Enjoy it – and your leftovers!